At American InterContinental University, our educational approach is designed around the realities and challenges of today’s busy lifestyles, and for over forty years, we have been helping students gain the knowledge, skills and confidence to pursue the next level of their professional development. If you’re in the process of researching schools where you can balance your current life and responsibilities with your desire to earn a career-focused degree, you’ve come to the right place. Your search is over, your dreams are real, and your future starts here. Contact AIU today, and discover the refreshingly different approach we’ll take to helping you achieve your educational goals. This information will be used to contact you through various means, which may include, phone, text messaging, email, and postal mail about the programs and services that are offered. American InterContinental University is regionally accredited by the Higher Learning Commission. You’re serious about success. Especially when it comes to pursuing an associate, bachelors or master’s degree you need to move your career forward. 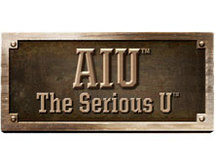 AIU is the Serious U™, and with your busy schedule, we understand that it’s hard work finding the time to work hard. At AIU you get pacing options that work around you and a 24/7 support system by phone, email or live chat. Our classes are taught by industry specialists who bring their real-world perspective to the classroom and will work with you one-on-one when you need it. AIU’s personalized education gives you customized course content that allows you to read, watch, or listen based on how you learn best. At AIU, the Serious U™, you can get started to get ahead. You can transfer in up to 75% of your qualifying credits saving you up to 75% on your bachelor’s degree.